Let me just say first that the Nerdkits microcontroller that i bought has just about been the most useful electronic component i've ever had. And since the guide had an open invitation to send images of interesting things done with said microcontroller, i figured i'd share my most recent project. i didn't buy it from think geek, but that was the first Google search result. 1) how to control five axis (10 switch) movement without using every single output pin, and 2) how to switch the 3 state motor control switches (+3v, ground, -3v)? The second, with opt couplers linked to transistors in pairs, each pair (as shown in the attached diagrams) linked to a motor, one wired to source current, the other to sink it (thereby controlling the rotation direction). I wired the whole thing up (my narrative belies the intensity of the trial and error period, which really lasted several hours), programmed the microcontroller to either run pre-programmed movement routines, or to be controllable via the serial port through hyper terminal. here is some video of the thing in action: http://www.youtube.com/watch?v=aWlhKG7cvzg it's slightly redundant if you read all the technical stuff up to this point. to the NerdKits staff: I appreciate your time and effort making this kit so educational and useful! Awesome! That is a really neat project. I just saw this video this morning and bought it an hour ago! Can't wait to play with it. Does anyone watch The Big Bang Theory ? They had a Very similar thing to this on the Show, that one of the main characters made doing the same sort of motion. It was only aired in November. Hi, I'm actually working on a similar project, and was wondering if you had an schematic for how you solved the 2nd issue (the 3 state motor). I've tried watching your youtube video but can't see very clearly the drawings. As of now I'm stuck because I can't get the current to change directions to control the movement. I should also add that I'm trying to use only one voltage source. This method is fairly effective but there is a catch! 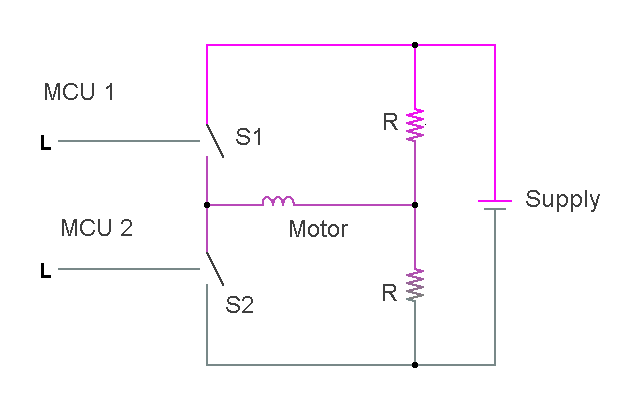 Activating S1 puts the motor and the lower resistor in series, for forward movement. Vice-versa for S2. Since the motor will be in series with a resistor, we want the resistor to be of low value to get the most power to the motor. But, if the two resistors are of some low value, since they are always in series with the supply, they constantly draw an ammount of current: I = V/(2R). This is a huge loss and will drain batteries quickly, so this setup is not very good. In this configuration, the Op-amp sets the voltage at the bases of the transistors at half the supply, as before, but now the current (and thus power) through the motor is independent of the values of the resistors, freeing us to make them as large as we want to minimize 'off' current of the circuit. I would say 10k apiece would be good. Strictly speaking, the circuit does not require the op-amp: the divider made of 10k resistors can be directly run to the bases of the transistors. In practice, however, I find that using the op-am tends to make the circuit more stabile. Additionally, depending on the current -draw of your motor, it may be wise to include resistors on the collectors of the transistors, and potentially one into the motor, if they seem to be over heating. Be sure that your motor uses the usual inductive load precautions, or else you are liable to smoke the transistors. Make sure that when writing your code you never run into a situation where both switches are closed (conducting) at the same time, or else you'll short your supply. Lastly, S1 and S2 are analog switches of some sort (relays, MOSFETs or opto-couplers). I prefer opto-couplers for MCU-motor work, but whatever you use, make sure that your MCU is properly protected from potential inductive or shorting damage from your switch of choice. Good luck building and coding! 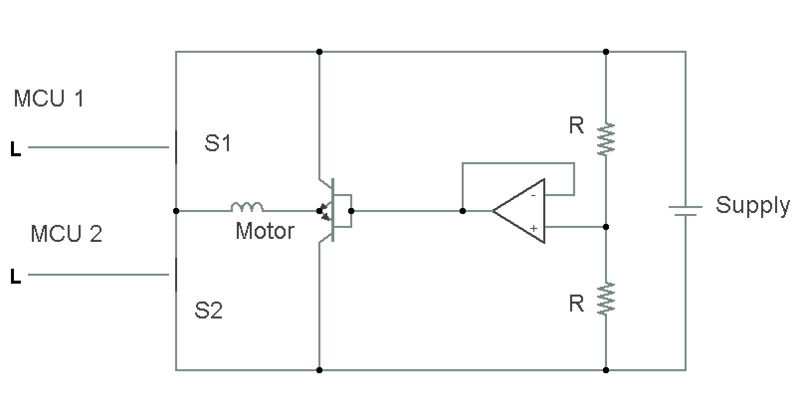 An H-bridge is another way to control a motor with forward and reverse. Google them, you'll find everything from home MOSFET built bridges to nice simple IC bridges. They are commonly used in small robotic projects. This is very helpful, thanks every one. I'll let you guys know how it turns out.